Two University of Mississippi biology professors have received a National Science Foundation award for nearly $800,000 to explore interactions between microorganisms and freshwater mussels in an effort to better understand the Earth’s biodiversity, focusing on how ecosystems function. 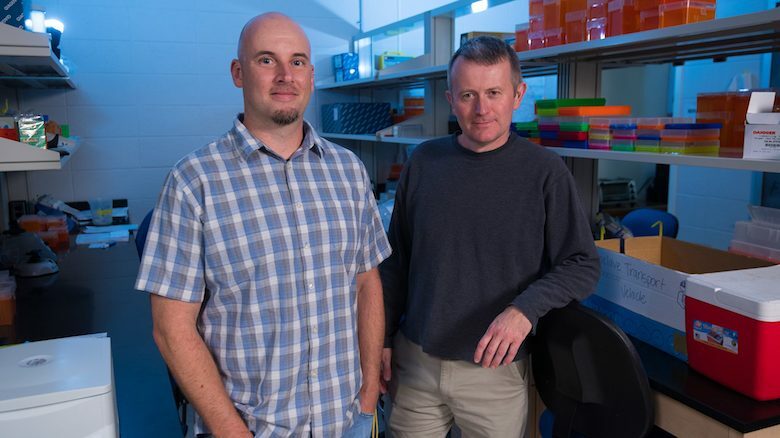 Colin Jackson, professor of biology, is principal investigator for the award, and Ryan Garrick, associate professor of biology, is co-principal investigator. The pair is working in tandem with Carla Atkinson and Jeff Lozier, two University of Alabama biological sciences professors who received their own NSF award. Holobiont is the term referring to the idea that animals contain a diverse community of microbes, their microbiome, which interacts with them. To better appreciate how an animal functions in its natural habitat, scientists need to consider not only the animal itself (the host) but also all its associated microorganisms (the microbiome). What is little known is how variation among hosts influences their microbiome, Jackson said. 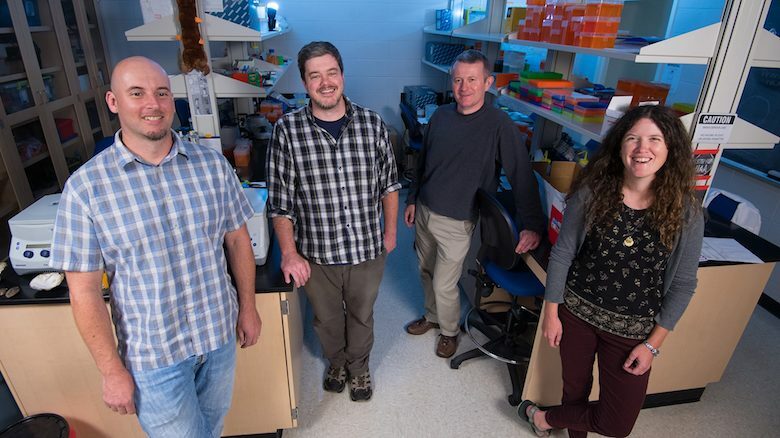 “What we will be researching is how different types of genetic variation interact and relate to the microorganisms that are found within an animal – the microbiome – and how these microorganisms affect how the host functions,” he said. Freshwater mussels are important contributors to how aquatic ecosystems function, serving as “ecosystem engineers” as they can modify aquatic habitats to make them more suitable for themselves and other organisms. The Southeastern U.S. is regarded as a global hot spot for mussel species diversity. Mussels clean water by removing particles; reduce erosion by anchoring themselves to lake or stream beds; provide a location for algae and aquatic insects to attach, creating habitats for fish; and serve as food for aquatic birds, such as herons and egrets, and mammals, such as raccoons and otters. But freshwater mussels are imperiled because of changes in river patterns associated with human activities, such as damming and channeling rivers, and increased erosion and runoff from agriculture and urban development. “Because mussels are important in helping clean aquatic ecosystems and provide habitat for other organisms, understanding their genetic diversity and how mussels function is important for restoration and conservation of these organisms and the ecosystems they inhabit,” Jackson said. The researchers also will be training students in approaches to studying biodiversity and creating materials to educate the public about the importance of mussels and freshwater biodiversity in general. The research will involve a combination of field research and laboratory analyses, with mussels being collected from Southeastern U.S. rivers and streams, mainly within the Mobile and Tennessee River basins in Alabama and Tennessee. “At UM, we’ll primarily be focusing on laboratory work, using modern DNA sequencing approaches to characterize the microbial community, or microbiome, of mussels that the UA team collects, and to determine the genetics of different mussel species,” Jackson said. The research team already has some mussel samples for genetic and microbiome work but will begin collecting more mussels in summer 2019. The award, No. 1831531, runs through August 2022 and includes funding for graduate students and a postdoctoral scientist to work with Jackson and Garrick. The award is among 10 awards from the NSF to fund $18 million in research examining processes in nature and their complex interactions with climate, land use and invasive species at local, regional and continental scales. The awards are funded through NSF’s Dimensions of Biodiversity program in the agency’s Division of Environmental Biology. The goal of the Dimensions of Biodiversity campaign is to transform how the scope and role of life on Earth are described and understood.